5. Math puzzle: Who dies? If the concepts are new to you, it's often hard to determine what's really happening in mathematics problems. I remember struggling with the concepts of x-position in space at time t, y-position at time t and then a particle's position in x-y space at time t. I added some animations to the Curvilinear Motion page to make things a bit clearer. 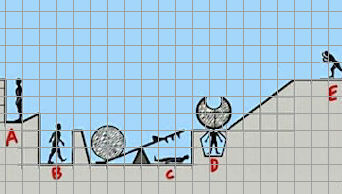 Of course, in this work, like most mathematics, it's essential to label your axes correctly! Most of you know I'm a big fan of employing technological approaches to "doing math". It doesn't make a lot of sense to me that we still make students churn through endless algebra exercises, when such things are much more quickly and accurately done by computers. However, such approaches come with a large danger - a small misunderstanding when setting up the computer to solve a problem can have drastic implications for the solution, which can turn out to be very wrong. So even more these days, good estimation skills have become essential. 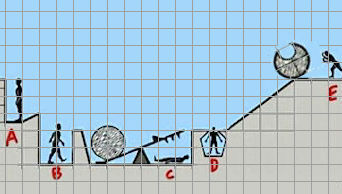 Before we ever get a computer (or calculator) to solve a problem for us, we should step back and come up with a "ball park figure" for the final answer. If the computer gives a very different answer to what we expected, we need to investigate further. With these thoughts in mind, I was interested to come across this article by the Norman Nielsen Group (user-experience experts) on the Anchoring Principle, an important concept for learning, but it can also be used by advertisers and political parties to sway opinions. The first part of the article discusses some very interesting experiments in estimation. How did you go? 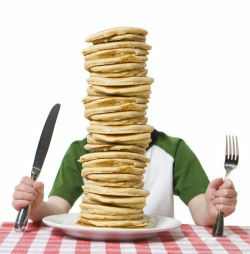 In the photo, we see a stack of pancakes where some have a larger radius than others. What if we needed to flip the stack so the largest pancake is on the bottom, and each subsequent one is smaller as you go up? What is the minimum number of flips needed to achieve this? This was a problem given to a Harvard undergraduate class in the 1970s, and Bill Gates was the first to solve it, with an elegant solution. Here is the actual paper "William Gates" published in 1979. Of course, efficient sorting is essential in computer operations, and I suspect that's why he was interested to solve this. There are still some of us who regard finding the truth as an important human endeavor. Many times, we can be distracted or confused by graphs that deliberately try to mislead. This animated map follows a timeline, showing how and when the major religions spread around the world. The puzzle in the last IntMath Newsletter asked about divisibility of a number. Correct answers with sufficient explanation were submitted by Ibrahim, Ajayshukla, Georgios, Alex, Elizabeth, Russell, Saikrishna, Aidan, Bandu, Vijay, Charles, Tugume, Kevin, Tomas, Gerard, and Alfredo. Special mention to Ibrahim and Bandu who made use of the math entry facility in the blog comments. New math puzzle: Who dies? Yolande Cornelia "Nikki" Giovanni, Jr. is an American poet, writer, commentator, activist, and educator. Her words are particularly relevant today. As the ball have less weight and one side oppen. And ball will stop over. No one dies. 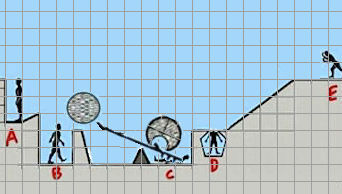 The cut-out on the boulder saves D, the radius of the teeter totter strikes the wall, plus the lower weight of the initial boulder cannot lift the second boulder, thereby saving C, so therefore the system comes to a halt, allowing all to live a long and prosperous life. 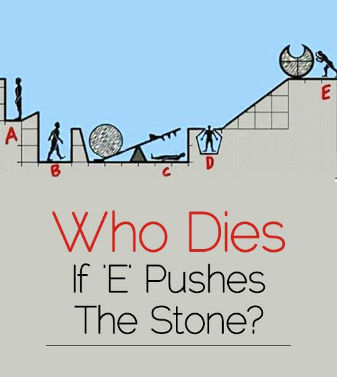 I would say, that if E pushes the stone C will die. There's quite a divergence of answers! Here's my take. 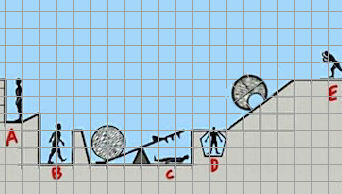 A key question is whether the rolling stone has enough momentum to project the other stone (which is heavier) high enough and far enough to land on B. 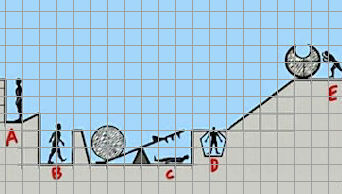 (Notice there's also a small ledge at the left end of the seesaw, which will reduce the distance the stone will go to the left.) It's possible the heavier stone brings the motion to a stop, thus saving C.
I shall leave further speculation up to the reader.